Nothing says summer quite like juicy, vine-ripened tomatoes still warm from the sun. Native to South America, tomatoes are a member of the nightshade family along with potatoes and eggplant, and were first thought to be poisonous by Europeans. It wasn’t until the twentieth century that tomatoes became a staple in the U.S., where they are now the third most popular vegetable. Although botanically a fruit, tomatoes have been classified by the U.S. government as a vegetable for trade purposes. 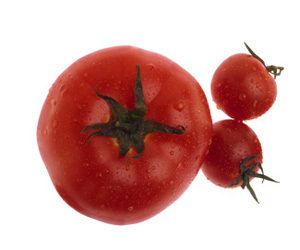 Select plump, heavy tomatoes with a rich color and pleasant aroma. They should be free of blemishes and soft spots. When gently squeezed, they should yield slightly and feel somewhat firm. Soft tomatoes are usually watery or overripe. If purchasing tomatoes off-season, select fresh plum and cherry tomatoes as they have slightly more flavor than large globe tomatoes. Store unwashed ripe tomatoes at room temperature for up to 3 days. Never refrigerate tomatoes before cutting as the cold temperature makes them lose flavor and become mealy in texture. Unripe tomatoes can be ripened by placing them in a paper bag. Do not place them in the sun to ripen. Refrigerate cut tomatoes in plastic wrap for 2 days, though flavor and texture will be diminished. For sandwiches and salads, remove the stems and cores with a paring knife. Slice, dice or cut into wedges with a serrated knife. To core a tomato, place it on its side. Insert the tip of a serrated paring knife at an angle into the stem end. Rotate the tomato at the same time you cut with a sawing motion. Continue until the core is separated and can be easily removed. To seed a tomato, cut it in half crosswise. Hold the tomato half over a bowl, cut side down, and gently squeeze to remove the seeds. Use a small spoon to remove any remaining seeds, if necessary. To hollow out a tomato for stuffing, cut in half or cut a slice off the top. Scoop out the seeds and pulp with a spoon. Invert the tomato shell and place on paper towels to drain for at least 15 minutes before stuffing. Provides a good source of vitamins A and C.
Whip up easy homemade salsa with chopped tomatoes, onions, jalapeño peppers, cilantro and a squeeze of lime juice. Toss freshly cooked pasta with pesto and diced tomatoes for an easy summer meal. Thread plump cherry tomatoes on skewers and add great color to grilled kabobs. Arrange sliced tomatoes and fresh mozzarella on a platter, drizzle with olive oil and garnish with fresh basil for an instant summer salad. Stir chopped seeded tomatoes into guacamole and other creamy dips for extra color and flavor.